A worker at MRPC verifies the process settings on a molding press at the firm's headquarters in Butler, Wis. This press is located in MRPC's Class 7 clean room. BUTLER, Wis.—Molded Rubber & Plastics Corp. has taken what it believes to be a gigantic step forward in refining its molding processes. Executives from the company that began 93 years ago as the Unbreakable Button Corp. say that the firm's commitment to the discipline known as scientific molding process development has improved production at a plant already known as a leading producer of components and devices for the medical marketplace. Scientific molding helps to ensure complete control over the injection molding process by focusing on the chemistry and composition of the material used, rather than just the machines utilized to create the components. 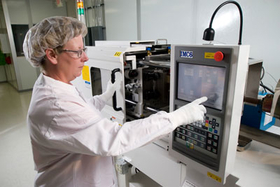 This process demonstrates that the molder adheres to an established set of principles throughout the process, an important attribute particularly in the production of medical components, where stringent requirements are in place. Manufacturers have practiced scientific molding for years, according to the company. It originally was intended for the development of molding processes with thermoplastic injection molding. MRPC has expanded the practice to include all molding processes. He said his company takes a more holistic approach to scientific molding. 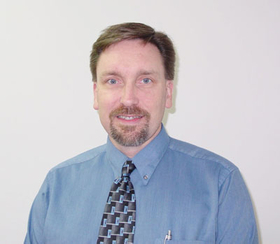 Jeff Randall, MRPC vice president of engineering. Rather than conduct shorter, two- or three-day seminars on the topic, MRPC committed to training some of its work force during the first five months of last year. Workers from all disciplines across the company, such as process engineers, process technicians, supervisors, quality engineers and project engineers attended close to 20, hands-on sessions on the topic. Randall said workers performed jobs they normally didn't do as a result of the training. For example, he said, some people now might question how the company plans to maintain a more uniform core temperature. Randall cited an example of how the process has impacted business. He said a material supplier referred MRPC to a customer who was having difficulty achieving consistent strength in one of its products. By testing the tooling process, Randall said MRPC identified issues in both the part design and tooling. “Through our process optimization and tooling optimization, we were able to achieve over twice the strength that they were getting from the previous molder,” Randall said. “The consistency and the performance they got out of the product from that point on was a big win for them. MRPC certainly has found success in the medical market. In the late 1980s to early "90s, with other customers moving business abroad, the company identified growth potential in the medical field. It had a few existing medical customers, but the firm made a conscious decision to pursue that market because of its stability, according to Mark Brandstaetter, vice president of sales and marketing. Soon, MRPC built clean rooms and began to target medical device companies. Today, about 85 percent of MRPC's business involves medical devices, including laparoscopic instruments, bari-atric surgical products and sports medicine components. It has customers in North America, China and Europe. The family-owned company does about $20 million in sales each year, and late last year it completed a 15,000-sq.-ft. addition to its headquarters in Butler, now 100,000 square feet. Two-thirds of the new space was dedicated to manufacturing and the rest to office space. The Butler facility, with 145 employees, handles thermoset rubber molding, silicone, both liquid and gum molding, thermal plastic injection molding, silicone extrusion and other assembling and packaging of those components. It has five clean rooms; one is Class 7 certified while the others are Class 8 certified. Two years ago, the company acquired a smaller facility in Largo, Fla., that specializes in liquid silicone rubber molding. It has a work force of 20. Brandstaetter said MRPC's strength involves its works in two-material molding, in which the firm will take two dissimilar materials and find a method to bond the products together during the molding process. “That niche is somewhat of an outcome of having the expertise of dealing with both thermoplastics materials and thermoset materials within the same facility and really honing our expertise in joining those together,” he said. “We deal with a lot of high temperature thermoplastic materials that can withstand the molding temperature of the thermoset process,” involving materials such as high-temperature nylons and some polycarbonates. The company is using that technology to pursue opportunities with medical customers that manufacture products designated for long-term implantation, devices intended to be in the body for more than 29 days. Those products involve even greater attention to detail.